Filemon Santiago Avendaño was born March 8 ,1958, in San Jose Sosola. He left his hometown to live in Oaxaca and study painting at the Taller Rufino Tamayo. His works and technique were refined when he moved to Chicago in 1978. The years he spent there brought him close to American, Latin-American and European cultures. He came back to Mexico after 15 years of living abroad and this is reflected in his landscapes where you can see a great American influence. 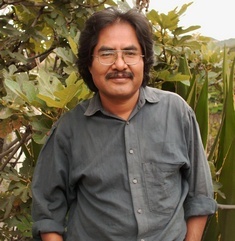 After more than 28 years he is considered one of the best artists from Oaxaca. Santiago has exhibited in Canada, the Netherlands, Japan, US, and Mexico. He has been awarded the Logan prize at the Art Institute of Chicago in 1980. There are collections of his works at the Museo de Arte Moderno and MARCO in Monterrey, Mexico, and the Museo de Punta del Este in Uruguay. The Art Institute of Chicago, Latin-American Modern Art Museum in Washington, Museum of Illinois in Springfield and Harold Washington Library in Washington all have collections of Santiago's work in the US. He traveled to the Netherlands in 1995 where he was a professor of fine arts and currently lives and works in Oaxaca.